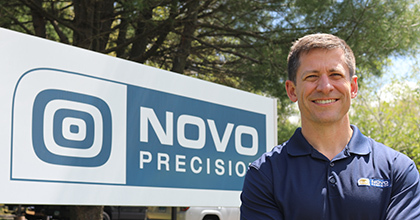 Novo Precision serves global markets with world-class medical staples and clips, cut-to-length wire products and precision machined components. But the company was outgrowing its space so fast, it might have been forced to turn down new work. Then the perfect solution materialized: A property right across the street came up for sale. It would increase the firm’s manufacturing footprint 100%—and help achieve Bill Hazard’s dream of doubling the business. But he needed to act fast. Bill Hazard experienced what precision meant in the banking world: a rapid response with precisely the help he needed to make things happen. Manufacturer of world-class medical staples and clips, cut-to-length wire products and precision machined components.